There is a new edition of the First Aid Manual released during 2011. This is still titled as the 9th Edition, but is marked as revised and includes the latest updates to the resuscitation guidelines which were released in 2010. 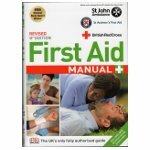 The First Aid Manual is the official guide from the UK leading first aid organisations: St John Ambulance, St Andrew's First Aid and the British Red Cross and is widely considered as the definitive guide to first aid in the UK. The first aid manual went through significant changes when it was updated to the 9th edition back in 2009 improving on what was already an excellent reference book. See my earlier review of the 9th Edition of the First Aid Manual. The book has now been updated, though released as a revised version to the 9th edition rather than a new edition. Comparing with the 9th edition there are only a few small changes on the front cover. To make sure you get the latest version look for the word Revised above the 9th edition and the BMA Medical Award Winner symbol in the top left. There are also few changes to the content from the 9th edition. The main changes being the depth and speed of compressions, additional instructions if a casualty starts breathing during CPR and a changed emphasis on compression only CPR for untrained members of the public. The new first aid instructions are based on the updated guidelines from the UK Resuscitation Council who regularly update the protocols where evidence shows an improved chance of survival. If you don't already have a recent version of the First Aid Manual then this is the best book available. If you still have an edition previous to the 9th edition then there are significant changes to the guidelines from those so I'd recommend getting a new version. If you already own a copy of the 9th edition then the changes in this particular edition are less than in other updates, but importantly still improve chances of survival. If you just have the first aid manual for personal reference then you may be a little disappointed if you purchase the new edition to find there are very few changes in it. For anyone undertaking first aid from a professional capacity (including workplace / childcare etc.) then when you next renew your first aid qualification you will learn the new protocols and having an up to date guide is important. Unfortunately there is no sign of an ebook version of the first aid manual yet. This is a shame as I don't take the first aid manual on holiday with me, but if I had it as an ebook on my Kindle it would mean that I would have it with me at all times. *Note the first aid manual is now available on some ebook readers - see below. The first aid manual is not a substitute for first aid training, but as a parent I consider it one of the most useful books I have and a worthwhile investment to help my family prepare for first aid emergencies. Since I wrote the review above I now notice that the First Aid Manual is now available as an ebook, although unfortunately not for the Kindle which is the ebook reader I have. The book is available as a DRM Encrypted PDF file from WHSmiths. buy from here. This is at the full retail price, whereas some retailers (including at the time of writing WHSmith.co.uk) sell the printed version at a discount. It's unusual for an ebook to be available at a higher price than the print version. The big issue for me is the DRM (why I think that DRM on ebooks is bad for consumers), which means that I can't download this and read it on the Kindle. I also use mainly Linux computers and would not be able to read it on those either. So for now I'm sticking with the print edition.